We are on Day Three of the SXSW Festival and the majority of our day was spent walking around some pretty great installations. The first one we attended was a fan art installation for Jordan Peele‘s Us. The moment you walk in, you’re faced with the costumes the Actors wore and the soon to be iconic scissors they use. You are then given a card that gets you one free download for the Soundtrack of the Film. They also treat guests to two drinks as they walk around the Exhibit. The Art is stunning to look and even more amazing considering it is Fan Art based on its Trailer alone. Then we headed to Amazon Prime Video’s Good Omens exhibit, taking place over an entire outdoor parking lot, and had quite the queue to get in. Once inside, you are given a free umbrella and tote bag that displays the Show’s title. As you walk around, Top 40 music is blared from Drake, Ariana Grande, Cardi B as you are treated to free chicken and pork, drinks, beers and wines. There is an area for people to get their hair and nails done, once again for complimentary, and a huge floor chess board for people to use. However, one of the greatest parts for us was getting to see the adorable puppies they had for guests to pet and swoon over! It is hands down one of the best times I’ve experienced so far this SXSW. It’s also certainly put the new show Good Omens, starring David Tennant and Martin Sheen, on our must-see list with all its hype. Check out the Trailer if you don’t believe us! When it came to the evening, the Premieres started down at the Stateside and Paramount Theatres. The first of the evening was Netflix‘s The Highwaymen, starring Woody Harrelson and Kevin Costner. Word has it that Willie Nelson and Matthew McConaughey came to the Premiere also. Next was Adopt A Highway, it’s a Blumhouse Production and stars Ethan Hawke, Betty Gabriel and more. While fans were waiting to catch a glimpse of Hawke from outside the theatre, they were surprised by two actors who were waiting to go in. Both André Holland (Moonlight) and Sterling K. Brown (This is Us) were outside Stateside Theatre talking on the sidewalk. When fans noticed it was them, they formed a crowd circling around them. Both were very patient and took Selfies with any fans who asked. The final Premiere of the night was Booksmart, which is the directorial debut for Olivia Wilde. Nearly everyone in the Cast was on-stage for the affair. When they arrived at the Red Carpet, many were friendly with the fans, but none more so than Wilde and her partner, Jason Sudeikis who stars in the Film too. Both came over immediately from exiting their vehicle and took time with fans. It was an extra special night for Wilde as she was celebrating her birthday. When she came on-stage to intro the Film, the SXSW team surprised her with a cake and the entire audience serenaded her with Happy Birthday. When the Film was over, the audience gave a standing audience with loud cheers. It’s true, Wilde‘s first Feature is a beautiful and near-perfect coming-of-age story. Review here. 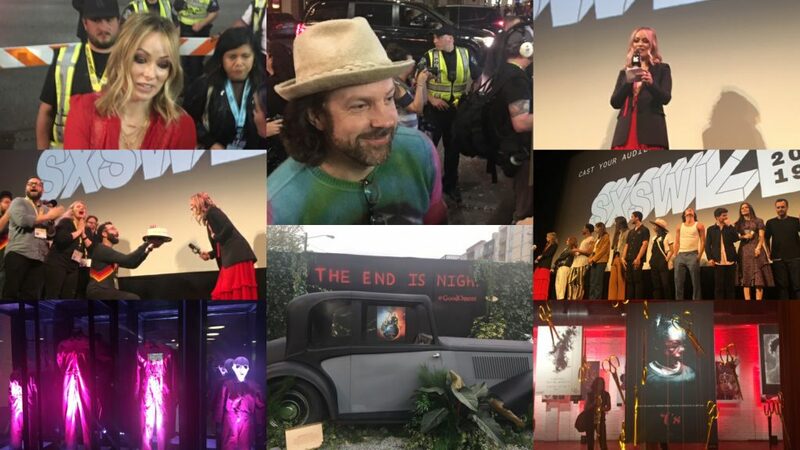 There are no signs of SXSW slowing down as there are even more Red Carpet Premieres are taking place tomorrow. There will also be some Panels consisting of Jason Blum, Ethan Hawke, Aidy Bryant and Elizabeth Banks. So stay tuned! Two new exciting star-studded Netflix Original Films to tell you about which will see a theatrical release and also be streamed right to your homes! The outlaws made headlines. The lawmen made history. From Director John Lee Hancock (The Blind Side), The Highwaymen follows the untold true story of the legendary detectives who brought down Bonnie and Clyde. When the full force of the FBI and the latest forensic technology aren’t enough to capture the nation’s most notorious criminals, two former Texas Rangers Frank Hammer (Kevin Costner) and Maney Gault (Woody Harrelson) must rely on their gut instincts and old school skills to get the job done. 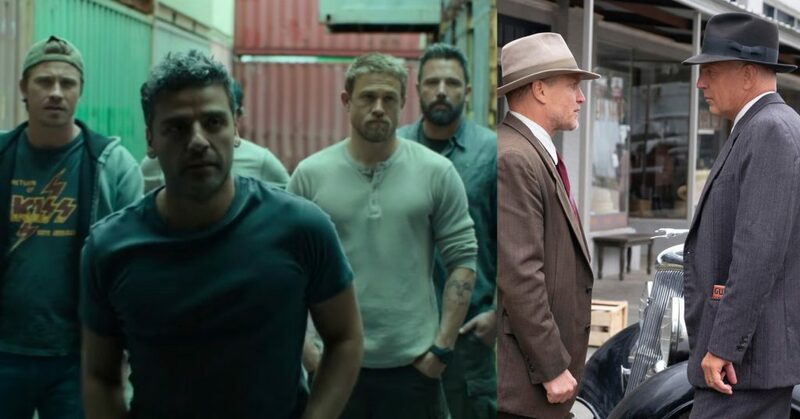 A group of former Special Forces operatives (Ben Affleck, Oscar Isaac, Charlie Hunnam, Garrett Hedlund and Pedro Pascal) reunite to plan a heist in a sparsely populated multi-border zone of South America. For the first time in their prestigious careers these unsung heroes undertake this dangerous mission for self instead of country. But when events take an unexpected turn and threaten to spiral out of control, their skills, their loyalties and their morals are pushed to a breaking point in an epic battle for survival. Directed by Academy Award® nominee J.C. Chandor (Margin Call, All Is Lost, A Most Violent Year) and co-written by Chandor and Academy Award® winner Mark Boal (The Hurt Locker, Zero Dark Thirty).